Artprize Piece Done, Done, Done…! 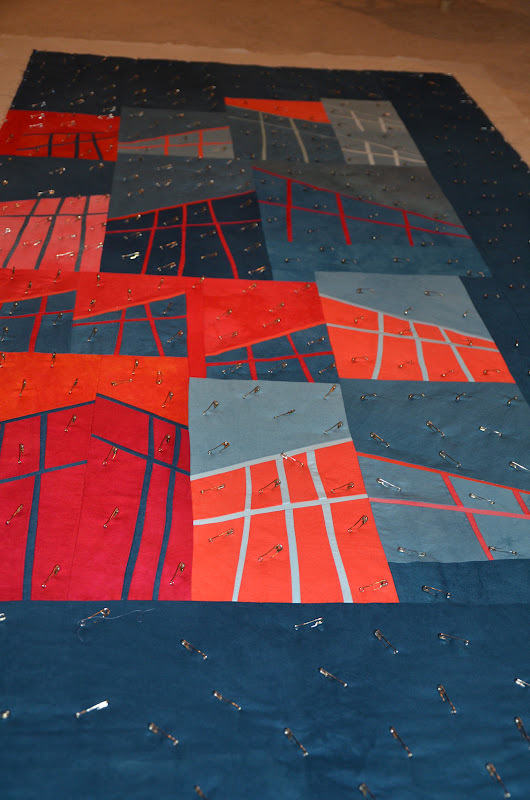 My composition, Rooflines # 6 , is a contemporary art quilt. This Rooflines series celebrates my fascination with the architecture of the Frederik Meijer Gardens here in Grand Rapids. The steel beams juxtaposed with the glass windows against the sky and the varying colors of nature contained within the conservatory building provide for a rich study of line, color and shape. 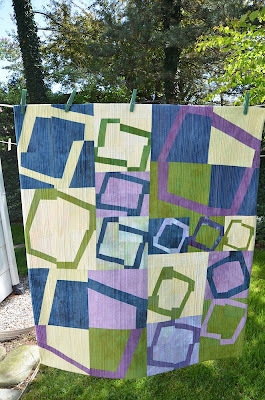 I have utilized my hand dyed fabrics as my paint and the free hand cutting of shapes and lines to create this piece. Dense machine quilting adds texture and another dimension for the viewer. I am done and it is a relief. A few more pieces of paper and then I can celebrate. Artprize starts September 19th and I am very excited to be one of a handful of textile artists to be accepted. This entry was posted in Artprize 2012, Quilts 2012, Rooflines series on August 21, 2012 by Colleen Kole. Just a sampling of what I did before the trip here last Thursday. Tried to finish up some fabric dyeing of deep browns, blues and a funny mustard color. I hand basted my Artprize piece-twice. The first time I didn’t follow the You Tube directions correctly using Sharon Schambers method. I really resisted hand basting but was going to hand carry this throughout the airport. The idea of hundreds of safety pins going off through security convinced me to do it. A few wobbly lines which I am calling organic have been sewn in. Yes, I am doing this one from top to bottom with the walking foot. And I squeezed in a little ice dyeing. I had a few pieces of fabric left and it was so hot I thought it a great time to try it. A little ice on top of soda soaked fabric. A little dye sprinkled on top of the ice and then a few more layers of fabric. Twenty four hours later, I rinsed as usual and washed and I have some interesting pieces. Nice markings on the fabrics and it was super easy. I was stuck in the airport for about 36 hours and my husband came to get me in a CT airport. I retrieved my lost luggage on Sunday which had the thread it in it for machine quilting. It was really an adventure from the netherlands which I have no idea why it always happens to me. But this time it exhausted me . In Vermont now for a few weeks and I hope I catch my breath enough to get the stitching down on Miss Artprize. This entry was posted in Artprize 2012, fabric dyeing, Quilts 2012, surface design, Vermont on July 24, 2012 by Colleen Kole. I finished piecing AND basting of my Artprize piece yesterday. It was a really long weekend….with several adjustments on one of the edges. I had to join what I had designed on two design boards and when I actually sewed it together it was a mess. I ran over to a friend’s house with all my various pieces in a plastic bag and she gave me some advice when I was not at all rational. ( Thank you Betsy!) Calm but not thinking straight. I returned home and out came the fabric for a few new pieces and more adjustments. It was frustrating to say the least but what a relief to have it this far. It will be about six by seven feet -large. I am anxious to get the machine sticking started. I thread basted it to reduce the weight of moving it under the machine. I will take it to Vermont with me on Thursday when I return there. It’s only 6 weeks away before I need to turn it in to the venue. I am about 3- 4 days behind on the schedule I set for myself. At 4 pm yesterday, I was way too cranky and tired to start machine stitching so I fiddled around with washing out some more hand dyes. This is a picture of earlier in the weekend. My tree in back of the fabric is so stressed with the drought, it is losing leaves and looks like fall. This entry was posted in Artprize 2012, Quilts 2012, working in a series on July 17, 2012 by Colleen Kole. I have journeyed back to Michigan (yup, a mixed up summer) late Sunday night and hit the ground running with all things art in my world. More tomorrow for you on that. But today I had a long awaited playmate with my very talented friend Terri Watson. She is a long arm quilter with a successful quilting business called Threadtales and a great teacher. I have wanted to try long arm quilting to see if it may be on my long term goal list. So today was the day. Terri had loaded a piece of muslim on her machine and after some quick instructions, I did a test run. I was initially afraid of this big machine but she drove so smoothly I felt like I was driving a supreme driving machine. I LOVED it. It was sooo much fun. And I need to tell you that it is very addicting. Then, she loaded one of my unfinished tops on the machine and away I went. I didn’t expect perfection. I just had fun and considering that I have done very, very little free motion quilting on my machine, my expectations were low. I felt as if I had been set free. The whole time I was quilting I thought-this is it. I want one. A jar full of pennies has been started-haha! I really can’t tell you how much fun I had. In two hours, I had the machine quilting done. Yup, two hours. Terri’s Gamill was truly a Mercedes. Thanks Terri- It was great catching up with you and I so appreciate this! You are the best! This entry was posted in free motion quilting, process of becoming an artist, Quilts 2012 on July 11, 2012 by Colleen Kole. I wasn’t able to go to the Vermont Quilt Festival this year as we arrived here about a week later. But I did submit one of my quilts, Rooflines 4. I re-titled it Rooflines #4: The Barns. I found out via a friend on facebook that it received one of the three Judges Choice awards and a red ribbon. It had a few “technical” issues-a few spots of bad thread tension and a little ripple that I am sure came back after folding it and packing it in a box. But someone liked it as much as I do! Just reminds me of the barns here in Vermont. You can find the complete list here: Vermont Quilt Festival Contest. The picture of my quilt is upside down. I had to laugh as I put two sleeves on it because it was so long it needed another rod on the bottom. I wonder if they hung it this way in the show. Haha! You have seen it many times but here it is again. We are hoping to go to fireworks tonight although the rain might postpone it. Happy 4th! 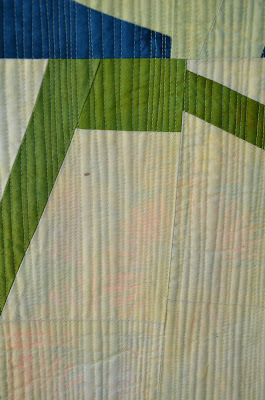 This entry was posted in Quilts 2012, Rooflines series, Vermont Quilt Festival on July 4, 2012 by Colleen Kole. I am very excited that this is done. I think I may have said that before. I don’t know why I fight with some more than others to finish them. I think I need to barter services with a friend who is a photographer and learn how to take better quality photos. It seems like a good summertime goal. There are always so many things to learn. 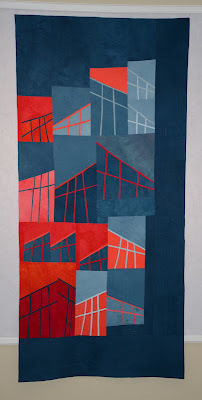 This entry was posted in Quilts 2012, Rooflines series, working in a series on June 5, 2012 by Colleen Kole. I am the worst secret keeper. My husband keeps the Christmas presents at his office because I find them, unwrap them and then wrap them back up and look semi-surprised. But I have sat on top of this one for a week. I really went into this with no expectations. I entered a proposal for Artprize 2012 this fall. And last week while I was at the Barn for my class I was notified that I had obtained a spot for one of my pieces at Cathedral Square-a really nice venue for this event. I was so EXCITED that I did the little happy dance around the hotel room. Thank goodness Betsy didn’t record it on a video camera. And I didn’t sleep a wink that night. But I didn’t want to tell you until I signed the little contract and actually spoke with the venue curator. It’s a go. It’s real. I am in and so excited. And a little nervous because I have yet to make it and it’s going to be 6×6. Goal: Composition done by July 15th so the machine quilting can be done is a stress free manner. Haha. I will share my progress along the way this summer. 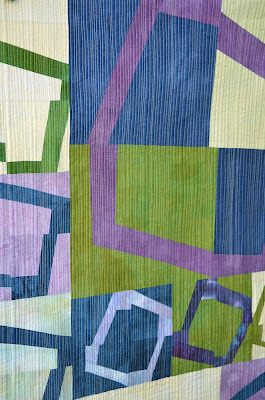 This entry was posted in artprize, Quilts 2012, Rooflines series on May 18, 2012 by Colleen Kole. That would absolutely be me! I keep thinking I have nothing really important to tell you or show you. And I get tired of telling you I am busy. But I am. Instead of 30 hours a week in the studio, I am lucky to get 15 hours. I went back to tracking my studio time and daily home schedule to see where I am missing things. I came to the conclusion that spring is all about kids and their schedules. And now I am grateful to even make that 15 hours of studio time! It kind of changed my entire attitude. I finally finished the quilting and binding on a piece I made last summer. I wasn’t happy with my thread choice and the way I chose to quilt it. I felt it muted the colors out too much. But I do love the texture that quilting gives, don’t you? Now that I see it in the bright sun, I am happier with it. Why are we so critical of our work all the time? Never leave your pins in this long-they leave a spot of rust. Of course’s it on the light fabric. Another piece done. What are you working on? This entry was posted in Quilts 2012 on April 17, 2012 by Colleen Kole. I am finally back to work this week and all the kiddos have returned to school. I spent the day sandwiching and basting the biggest piece I have in the work basket. With the last bit of machine quilting I did, I quilted a huge wrinkle in it. Obsessive as I am, I ripped out all that stitching and re-basted. So, with this piece, I wanted to ensure it remained wrinkle free. I might have overdone it on safety pins though. You can laugh but I have no time to rip things out this spring! This entry was posted in Quilts 2012, working in a series on April 11, 2012 by Colleen Kole. I have no excuse other than the weather has been way too nice to be inside. I am soaking up all this abnormally warm and sunny weather the past week. And my daughter has been home from college on spring break. I watched as they chopped down two huge trees in our yard last week. They were absolutely hollow inside so I am glad they didn’t fall during a storm into my neighbor’s yard. Sad to see them go though. I finished machine quilting a really old piece last week from my work basket. This was the one my dog ate the edge of the border when it was laying on my ironing board. I can’t decide which way to hang this one so haven’t attached the sleeve yet. Finished though and that’s a great way to start the week. I am helping out this week at our local guild workshop for West Michigan Quilt Guild and the teacher is Lyric Kinard. I can’t wait to meet her and see what she has to share with us. This entry was posted in Quilts 2012 on March 25, 2012 by Colleen Kole.